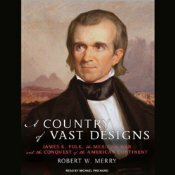 Posted byBrad Hepp December 21, 2012 December 27, 2012 Leave a comment on Review of Robert Merry&apos;s "A Country of Vast Designs"
Robert W. Merry’s “A Country of Vast Designs: James K. Polk, the Mexican War and the Conquest of the American Continent” was a great Audible book to listen to at the end of the recent Presidential election. This book chronicles the political struggles underlying America’s expansion by territorial acquisition during the Polk administration, 1844-1848. Back then it was Democrats versus Whigs. A Republican, I was reeling from the recent election, and ready to find fault with the mid-nineteenth century Democrats. As I listened to the background stories of Andrew Jackson and Henry Clay, it slowly dawned on me that the Democrats of the 1800s would be most comfortable in today’s Tea Party. They believed in de-centralized government, sought strict-constructionist judges, and were guided by a belief in American exceptionalism. One reviewer of this book did not enjoy reading about the “insignificant politics of Polk’s presidency.” I’ll admit that the boy in me would like to see more action, fuller descriptions of the Mexican War, a travelogue of Zachary Taylor’s and Winfield Scott’s invasions of Mexico–especially Scott’s march from Veracruz to Mexico City. One garrison he established on his route was my birthplace: Puebla, Mexico. Listening to this book helps me understand that history is more than the story of generals and battles. Apart from political wrangling, there would be no armies, no declarations of war, no peace treaties. By 1844, when Polk was elected to the US Presidency, politicians were already engaged in the arguments that would lead to the Civil War. Polk navigated the increasingly treacherous waters of abolitionism and states rights. He figured out ways to make progress in fulfilling his goal of territorial expansion despite the competing forces that would rend the nation within two decades. Robert W. Merry paints vivid portraits of the various political figures. In Merry’s narrative, their intelligence, courage, and persistence contrasts favorably with shallow motives and shortsighted actions of action figures like Santa Anna, Zachary Taylor and John C. Frémont. I look forward to reading another book that Robert W. Merry published four years earlier: “Sands of Empire Missionary Zeal, American Foreign Policy, and the Hazards of Global Ambition.” The title of this 2005 book suggests that Merry is not a fan of what some regard as American imperialism. Yet his account of the Mexican War and the conflict with Great Britain over the Oregon Territory is measured and non-judgmental. He does not glorify politicians who opposed the Mexican War as a moral outrage. He carefully lays out many of the best justifications for the war with Mexico and the conflict with Great Britain. There was simply insufficient settlement by their own people for the Mexicans or Brits to justify their ownership. In the case of Mexico, there was little semblance of political order in the decades after they won independence from Spain (1821). They were in no position to protect what settlers they did have in their Northern lands. This was in large part the justification for Texas’ War of Independence with Mexico (begun in 1835). The Audible Book version of “A Country of Vast Designs” is narrated by Michael Prichard. I see that Prichard has narrated MANY books. With good reason. He is a terrific narrator. In some sections of Merry’s account his writing style seems influenced by the flowery style of mid-nineteenth century prose. It would be hard NOT to reflect the style of his best contemporaneous sources. But Prichard deftly differentiates between Merry’s style and the grandiloquent speech of men like Edward Everett, one of the nation’s foremost orators (famous for the 2-hour speech preceding Lincoln’s 2-minute Gettysburg Address). He also does a good job suggesting accents of colorful old politicians and generals. Prichard successfully reflects Merry’s vivid portrayals in his reading.